I suppose I have little option but to upgrade. And I am resigned to being “targeted” by advertisers selected specifically for me. I take some comfort in the fact that I cannot recall actually buying anything because of a web advertisement. I suppose I am just too old for them. The soul – however you want to define it – is manifested (not defined) in your behaviour. The advent of the internet and its apparent anonymity actually makes visible some parts of your hidden self. People visit sites and make comments that they would never otherwise do if they were in public view. Of course much of that anonymity is only a perception. Your internet “self” (ID, email, passwords, sites visited, on-line community memberships,…. ) comes closer to painting a picture of your soul than just your visible behaviour. And Windows 10 acquires more of your soul than ever before – and all with your consent. It is with your consent because few will ever read and understand the 45 pages of terms and conditions that must be agreed to. Not that Apple and Google are not also involved in photographing and capturing your soul. But even an on-line presence is only a manifestation of your soul and each of Microsoft or Google or Apple have have their own painting of your essence. And these perceptions of who you are, these paintings of your soul, are theirs to sell – to advertisers or to governments or to other interested parties. Hundreds of commenters on sites such as Hacker News and Reddit have criticised default settings that send personal information to Microsoft, use bandwidth to upload data to other computers running the operating system, share Wi-Fi passwords with online friends and remove the ability to opt out of security updates. Elsewhere, Windows 10 also harvests user information in order to teach the built-in personal digital assistant Cortana, Microsoft’s answer to Siri. To enable Cortana, the company says, it “collects and uses various types of data, such as your device location, data from your calendar, the apps you use, data from your emails and text messages, who you call, your contacts and how often you interact with them on your device”. Users are given the option to opt out of most of the data collection, but critics say that that isn’t enough. Alec Meer, of gaming website Rock Paper Shotgun, says: “Microsoft simply aren’t making it clear enough that they’re doing this, how it might affect you and how to opt out – despite chest-thumping, we’re-all-chums-here talk about how ‘real transparency starts with straightforward terms and policies that people can clearly understand’. In many ways, however, Windows 10 is merely moving closer towards what has become the new normal thanks to mobile operating systems. Both Siri and Google Now require access to the user’s personal information to personalise responses, while both Apple and Google offer developers the ability to deliver personalised ads to users based on information such as app installs. The Solar Impulse 2 “adventure” is over. The lithium-ion batteries have overheated and have been irreversibly damaged. It may fly again in April 2016. Even if it does, that cannot – by any stretch of creative hype – be considered a part of this journey which has effectively been abandoned. By April 2016 a new plane could be built. The planned duration of the whole flight was to have been 5 months. But 4 months after starting in Abu Dhabi the plane has been grounded in Hawaii after completing 17,800 km of its planned 35,000 km journey. This flight has done little to demonstrate “perpetual endurance” or “unlimited autonomy”. Every flight starts with fully charged batteries (presumably charged from the grid and that would be fossil energy) and the solar cells need to top up the charge lost during night flying during the day. What has actually been demonstrated with the maximum flight length of five days is that – at best – the stored charge declined by 20% each day. Moreover the batteries suffered irreversible damage after a 5 day flight. That suggests fatal-flaws in the design of the plane, both in the sizing of the solar panels and in the design of the batteries. Firstly, either the power absorbed during flight has been under-estimated or the recharging capacity has. Secondly the immaturity of the battery technology and the inherent risk of over-heating during recharging has popped up again (as with Tesla, Volt and the Dreamliner). Certainly it has demonstrated the endurance of the pilot flying solo and all credit to him for that. But it has not provided much in the way of new science or demonstration of engineering or technology. That solar cells work and solar energy can be converted into electricity is not new. That battery technology is still struggling to provide efficient, reliable and sustainable charging and recharging has been demonstrated but it did not need a plane to do that. That the cost and weight of extra cells needed to compensate for the lack of solar energy at night is still a major challenge, remains the state of the art. Following the longest and most difficult leg of the round-the-world journey which lasted 5 days and 5 nights (117 hours and 52 minutes), Solar Impulse will undergo maintenance repairs on the batteriesdue to damages brought about by overheating. Leg 8: 28 June. 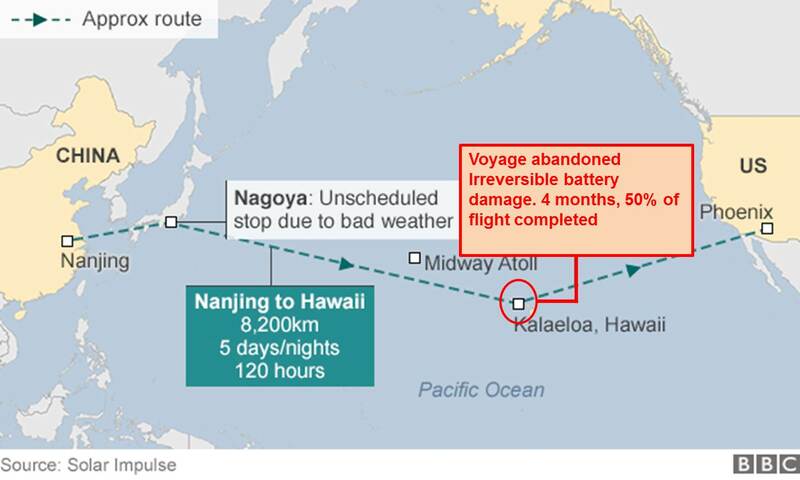 Nagoya (Japan) to Kalaeloa, Hawaii (USA) – 7,212km; 117 hours and 52 minutes. The story is now being spun madly to get some PR benefit, but if the objective was to demonstrate unlimited autonomy then it has been a fiasco. Five days and nights is a long way from being unlimited. Previous posts on the GE acquisition of Alstom are here. The GE 9HA gas turbine (nicknamed Harriet after a Galapagos giant tortoise) is being built at their Belfort factory and is surely a giant. At 400 MW it will be the largest gas turbine ever built and will give a combined cycle of, nominally, 600 MW output from a single GT/ST block. This will be the first “H” class Frame 9 machine (Frame 9 is for 50Hz and Frame 7 is for 60 Hz) and it is reported that just scaling up the 7HA engine to the 9HA has cost GE about $1 billion in R & D. Two such 9HA GT’s with a single steam turbine in a 2+1 configuration would give a 1000 MW power block. The 9HA weighs in at about 400 tonnes. Strong, powerful stuff. This is the same facility which was part of Alstom while Alstom was a GE licencee and before it was separated from the rest of the site when Alstom acquired ABB’s power generation business. This particular engine is for a gas turbine combined cycle plant for EdeF’s Bouchain North plant. Alstom still has a large part of the Belfort site but Alstom’s power part of the site will go to GE if the acquisition of Alstom’s power and grid businesses now gets approval for the EC. The portion of the site dedicated to transport will remain with Alstom. The steam turbine business at Belfort for nuclear turbines will be in a GE/Alstom JV (project name Arabelle) but I expect that Alstom will (must) exit in due course, though the French government will not allow the nuclear power part to be entirely out of their control. If the deal goes through the French government will have 20% of what is left of Alstom (mainly transport plus their share of the 2 JV’s with GE) and Bouygues will have their (albeit partial) exit. Most other countries have already approved the acquisition including India, South Africa and Brazil. It has not been much of an issue in the US where Alstom’s business is small compared to GE’s. The long draw-out EC process sticks out. Yesterday the French Economy Minister, Emmanuel Macron, visited Belfort and his highly publicised visit to both the GE and the Alstom parts of the site was a very visible “blessing” from the French government for the deal. He took the opportunity to warn the EC and Margrethe Vestager, the European commissioner for competition, not to hinder the deal since this would only help the Chinese competitors. I note that Patrick Kron, Alstom’s CEO, was conspicuous by his absence. His €4 million termination deal with Alstom (once the GE deal goes through) has been heavily criticised by the French socialist government. Mind you these same leftists had also talked about “treachery” when the deal was first announced. The French press has also criticised Vestager for being too finicky. Needless to say the EC is not amused. Politico: Emmanuel Macron warned that blocking the deal would only bolster Chinese rivals and cost jobs in Belfort, where GE and Alstom are the largest private employers. He has met with Margrethe Vestager, the European commissioner for competition, on two occasions in recent months. The Commission put the brakes on the deal in late February, announcing an in-depth investigation into the combined market power of the two companies. The Commission said it was concerned about preserving competition in Europe for heavy-duty gas turbines. As the clocked ticked down in May to the Commission’s deadline for GE to submit more information and data, GE’s Chief Executive Jeff Immelt signaled he was ready to bargain, potentially selling some of the intellectual property. The Commission reset the clock and must now decide by August 21. Macron’s intervention is unlikely to please European Commission officials. Seldom do national governments take a public stance on mergers being reviewed by the EU competition authority, which does not take into account a deal’s effect on employment. …… Immelt has drawn a red line around Alstom’s business that services gas turbines. That lucrative segment underpins the economic rationale. As I have posted earlier, GE will walk away from the deal if the EC demands conditions which impairs the service revenue from Alstom’s existing gas turbine fleet. From my experience it is this revenue which probably enables the deal and impairment here could be fatal. The EC will need to be very precise in demanding concessions from GE while ensuring that the deal does go through. Divesting parts of the HDGT business to unknown (and probably non-existent) buyers is probably a lose-lose solution. I expect that GE’s walk-away point will be reached if earnings from the service of Alstom’s fleet of gas turbines is removed from the mix. In fact any conditions set by the EC which dilute future revenues could prove fatal for the deal going through. Assurances about keeping R & D located in Europe and assurances about jobs and even about R & D budgets could be absorbed by a robust business plan. But no business plan can survive if something as fundamental as the revenue stream is adversely affected. And it is the volume of that revenue stream – and not just the margin from those revenues – which is crucial. Macron does have a point though. If EC conditions are so onerous that GE walks away from the deal, Alstom will most likely have to find another (or several) buyers who will not pay anything like as much as GE have offered. If the EC insists that GE must sell Alstom’s sequential combustion business or the technology, any buyer would need to have a high enough technological base and very deep pockets – and that may be an impossible ask. Alstom clearly has no heart left to continue the business by itself. And then Shanghai Electric (leveraging its 40% ownership of Ansaldo) has some interesting possibilities of becoming one of the Big 4 in the gas turbine world (the others being GE, Siemens and Mitsubishi). Today, in the orangery in the grounds of Finspång Manor, a little gem of a museum was opened. A website is in its infancy. It records the quite remarkable, more than 100 year old, history of the manufacture of steam and gas turbines in this little town. Finspång town has a population of a little over 15,000 today but has an industrial tradition dating back to 1641 and was for 200 years at the forefront of cannon manufacturing (before the advent of the rifled barrel). They had a reputation for usually supplying cannons to both sides of many European wars of the 18th and 19th centuries. Turbines have been manufactured in Finspång since 1913 but the technology also has a thread going back to Gustaf de Laval who invented his steam turbine in 1883 and put it into production in 1893 in Stockholm. (In the UK, CA Parsons invented his steam turbine in 1899). The Finspång manufacture of turbines by the STAL company built on the ingenious inventions of the brothers Ljungström, Birger and Fredrik. The two strands of the de Laval and Ljungström technologies came together later in 1959 and STAL became STAL-Laval. Ownership of the factory in due course shifted to ASEA and then to ABB and for a short while was with Alstom and then eventually moved to Siemens who are the current owners. 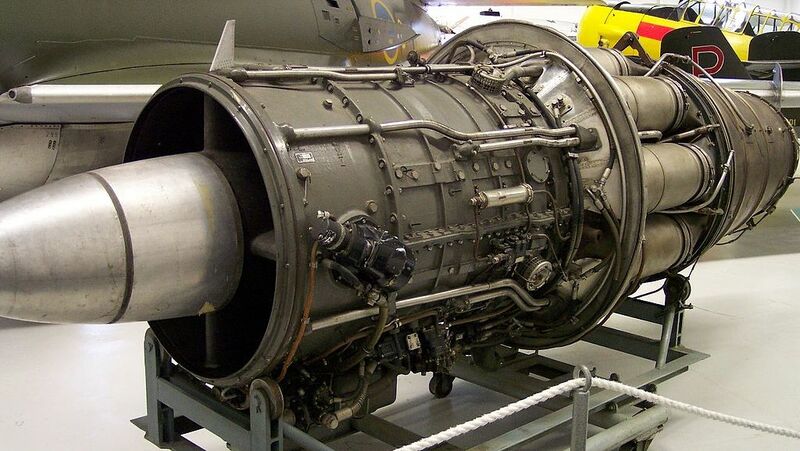 Gas turbines came into the picture in 1945 with the development of a jet engine (the Dovern) for the Swedish Air Force. That engine flew only once (under another aircraft for a test) and never “in anger”. The Swedish Air Force chose Rolls Royce for their engines and STAL converted the development for industrial use. The engine morphed into an industrial gas turbine, the GT35, which first went into operation in 1957 and this engine – with a further development or two – is still around in the Siemens stable. In 1959, STAL delivered a 40MW gas turbine, the GT120, which at the time, was the world’s largest. 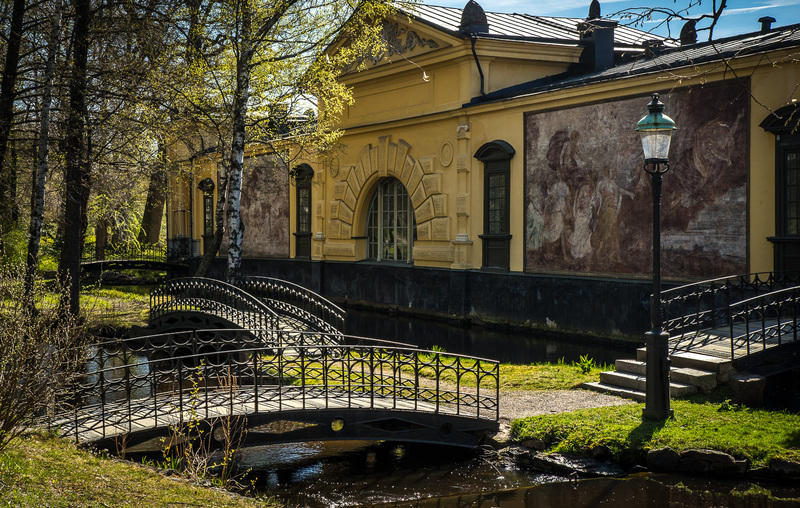 The Finspång Orangery (built in 1832) in the grounds of Finspång Manor is, at first sight, a most unlikely place for a Museum of Turbine History. But even with its wall frescoes and painted ceilings which evoke a long-gone age of gracious living, the turbines do not seem at all out of place. An older Orangery burnt down in 1830 and the current building was designed by Lars Jakob von Röök. On two of the back, north-facing walls are frescoes said to be by the Italian painter Guido Reni. (But since Reni was born in 1575 and died in 1642, that is either wrong or the walls are much older and survived the fire of 1830. Since the manor was only built between 1668 and 1685, it is more likely that the artist was someone other than Guido Reni). Siemens has provided the Orangery as a home for the Museum, which has been put together by volunteers. They are still working to organise the wealth of material and drawings and pictures and films and models that are gathering dust in the catacombs under Finspong Manor. Through the summer it is hoped to be able to have the museum open on Wednesdays and Thursdays. In any event the Finspong Manor grounds are well worth a visit and for anyone interested in rotating machinery, the museum should prove fascinating. (The manor itself is used as offices and is closed to the public. However the chapel – now run by the Swedish Church – is a little jewel of a chapel). Currently the Finspång facility is the main centre for Siemens’ range of industrial gas turbines and ceased manufacturing steam turbines earlier this year. But the turbine tradition is now into a 6th generation. In now dealing with the European Commission’s antitrust office, Mr. Immelt has not forgotten the harsh experience of his predecessor, Jack Welch. In 2001, Mr. Welch failed to win approval for a proposed $42 billion takeover of Honeywell International after objections were raised by Mario Monti, the European antitrust commissioner at the time. Mr. Immelt was worried enough last week that he met with Ms. Vestager in Brussels, where he also gave an address at the American Chamber of Commerce highlighting Europe’s economic potential. In that address, Mr. Immelt said young Europeans were “awesome” and “amazing,” but he emphasized that Europe needed investment to gain competitiveness and beat unemployment. If G.E. is unable to convince Ms. Vestager of the merits of its case, the next step could be a so-called statement of objections, as soon as next month — formal charges that would outline the commission’s specific antitrust concerns. G.E. and Alstom could avoid that step by offering remedies sooner, perhaps proposing to sell parts of the gas turbine business in Europe. My expectation was that the European Commision would look for some concessions from GE and would only grant a conditional approval for the acquisition of Alstom’s power and grid businesses. Will the EC approve GE’s acquisition of Alstom’s power business? …. In any event, I expect that the deal will go through, but I will not be surprised to see an approval conditional on some assurances from GE regarding R & D centres, R & D jobs and/or R & D budgets in Europe. I think it highly unlikely – and a little meaningless – if the EC were to ask for divestment of Alstom’s HDGT business to a third party (if any such exists). The bottom line is, I think, that Alstom’s HDGT technology has come to a dead-end and can not be developed any further in their own hands. While the business can continue in a diminishing way for some years, Alstom technology has no long-term value except to another party which has access to high temperature cooling technology. To have Alstom continue with the HDGT business as an unwilling and reluctant player does no one any service at all. This Reuters report today suggests that my expectation may be close to the mark. However it also seems that if the EC demands too much in the way of concessions, GE might walk away. Clearly GE are already getting a little irritated at the protracted nature of the EC approval process. The failure of the deal is not something that Alstom or the EU would look forward to. The EC decision may also be delayed somewhat beyond August 6th. … EU regulators typically prefer merging companies to sell overlapping assets or make it easy for rivals to enter the market. 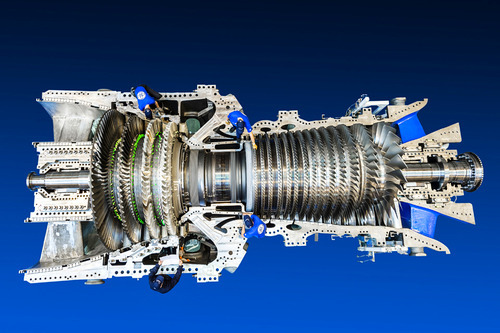 GE’s gas turbine competitors include Siemens AG and Mitsubishi Heavy Industries Ltd.
…. GE, which is undergoing an overhaul involving the exit of most of its finance assets, has said it expected synergies from the Alstom deal to add between 6 to 9 cents in earnings per share in 2016. But some analysts have told Reuters they doubt GE’s stock would take a big hit should the deal collapse, with the idea that GE could make up those earnings with stock buybacks or other deals. ……. …… EC spokesman Ricardo Cardoso said regulators are waiting for data from the companies before a setting a new deadline to act. The previous deadline was Aug. 6. Bloomberg: General Electric Co.’s Jeffrey Immelt is set to meet with the European Union’s antitrust chief Tuesday as the U.S. company seeks approval for its acquisition of Alstom SA’s energy business. The session in Brussels between GE’s chief executive officer and Margrethe Vestager is part of regulators’ “ongoing merger review,” Lucia Caudet, a European Commission spokeswoman, said in an e-mail. On February 23rd this year the European Commission announced that its preliminary investigation into the proposed acquisition of Alstom’s power businesses by GE had highlighted Heavy Duty Gas Turbines (HDGTs) as a potential area of concern. Therefore an in-depth investigation would be carried out. This investigation was due to have been completed by 8th July but has been extended – apparently at GE’s request – till August 6th. The European Commission has opened an in-depth investigation to assess whether General Electric’s (GE) proposed acquisition of the Thermal Power, Renewable Power & Grid businesses of Alstom is in line with the EU Merger Regulation. The Commission’s preliminary investigation indicates potential competition concerns in the market for heavy-duty gas turbines which are mainly used in gas-fired power plants. Since GE already has HDGTs in direct competition with Alstom’s GT24 and GT26 engines and even with Alstom’s GT11N2 and GT13E2 engines, I expect that the Alstom range of machines will have to be discontinued. (It would be quite irrational for GE to continue to offer Alstom’s portfolio except for a very restricted time period or for some very particular application. It is not much appreciated by a buyer either when a supplier appears so confused as to offer different machines for the same purpose). The discontinuation of some engines is “no big deal”. But, as I have written previously, it would be a shame if the line of technology for HDGTs within Alstom – which carried forward the lines of technology emanating from BBC, GEC, Asea and ABB (including sequential combustion technology) – were to be entirely lost. If the European HDGT market can be said to be distinct from the global market, then the number of HDGT suppliers would effectively reduce in Europe from three to two. Reduced competition in Europe could lead to supplier(s) having greater than 40% market share and could lead to an increase in prices. GE together with Alstom could have greater than 50% market share and not only in Europe. Competition in the HDGT service business would be impacted since Alstom currently is an alternate supplier of service to older GE HDGTs (since Alstom was a GE licencee prior to 1999). The market for HDGTs is characterised by high technological and financial barriers to entry, leading to a concentrated market with only four globally active competitors: GE, Alstom, Siemens and Mitsubishi Hitachi Power Systems (MHPS). The fifth player, Ansaldo, appears to be a niche player with a more limited geographic reach. The margins in the market for HDGTs appear to be higher than those of neighbouring markets for power generation equipment such as steam turbines. The HDGTs market worldwide is divided into two frequency regions, namely those operating at 50 Hz and those at 60 Hz. All thecountries in the European Economic Area (EEA) operate at 50 Hz frequency. Since MHPS seems to be less active in the EEA than in the rest of the world, the transaction would bring together the activities of two of the three main competitors in the EEA.The transaction would eliminate Alstom from the market, leaving European customers without an important competitor of GE and Siemens. Indeed, in the market for the sale of new 50 Hz frequency HDGTs, the merged entity would reach high market shares in the range of around 50 %, both in the EEA and at worldwide level excluding China. Finally, in the market for the servicing of General Electric’s mature technology HDGT frames, the transaction eliminates competition by Alstom’s subsidiary Power System Manufacturing. Overall, the Commission is at this stage concerned that the transaction may lead to an increase in prices, a reduction in customer choice and a reduction of R&D in the HDGT industry, leading to less innovation. Sharis Pozen, a former acting assistant U.S. attorney general for antitrust who joined Skadden, Arps, Slate, Meagher & Flom in July 2012, left the firm this month to become vice president for global competition and antitrust at General Electric. Pozen is the latest high-profile Am Law 100 partner to join the in-house legal ranks of the Fairfield, Conn.-based conglomerate, which has tapped Skadden to advise on its pending $17 billion buy of the energy unit of French engineering giant Alstom. However, my own opinion is that these potential EC concerns are not sufficient to disallow the proposed acquisition. I believe the market concerns are more theoretical than real. 1. While the EC tends to look at market share rather than market size, the EU market currently (before the advent of shale gas in Europe) is so small that it cannot be considered a market distinct from the global market. No HDGT manufacturer could survive on the strength of the European market alone. A simple test question is very revealing. Could Alstom’s HDGT business be sold as an independent stand-alone business to anybody else with only Europe as the designated market? The answer is a resounding NO and, I think, should eliminate any consideration of the European market as being distinct from the global market. In fact, even with a global market available, the Alstom HDGT business is of little value to any manufacturer who does not already have high temperature cooling technology and who does not already have a heavy rotating machinery manufacturing background. And I don’t see any such parties around. 2. It should be remembered also that Mitsubishi (formerly MHI now Mitsubishi Hitachi Power Systems – MHPS) is absent from Europe as a matter of their own choice – not because they cannot. It is part of the remains of the old “unofficial” arrangement where the Japanese didn’t come into Europe and the Europeans didn’t enter Japan. This “arrangement” for steam turbines, gas turbines, boilers and generators held quite well through till the 1980s but broke down in the 1990s. Note that the Japanese gas turbine market had a special relationship with the US manufacturers with TEPCO providing GE with a protected “home” market for 60 Hz gas turbines. The Westinghouse relationship with MHI for gas turbines was effectively taken over by MHI. The Siemens equity engagement with Furukawa to create Fuji Electric (Fu- for Furukawa and Ji for Siemens in japanese, jiimensu) was ended after WW 2. The ABB (later Alstom) JV for gas turbines with Kawasaki which I headed for a time was only set up in the 1990s and was eventually discontinued. To enter a new market for HDGTs, it must either be a growing market or it must have a large fleet of existing machines which can be served. Europe provides neither for MHPS at the present time. If shale gas takes off in Europe and the gas turbine market starts to grow (which I predict will happen), it will not take very long for MHPS to enter. For MHPS the market size and growth for new equipment must be sufficient to justify the cost of setting up the necessary service network. There is no guarantee either that Alstom – without GE – could continue with a product range rapidly becoming uncompetitive against the “J” class machines, without access to high temperature cooling technology. The Ansaldo/Shanghai Electric tie-up is still in its infancy and – in the event of market growth in Europe – would surely become a significant 4th player. (Even a 5th global player could emerge as a consequence of a particularly strong market growth and my guess would be that it could be Doosan or BHEL, Harbin or from Russia). But as far as the EC is concerned, the key point should be that if the market grows there will be certainly three, probably four and eventually five players. And if the market does not grow then the objection is moot. 3. The risk of one player having 50% (or greater than 40%) market share is not to be trivialised but, in my opinion, is not a real threat. When the market (in Europe) has been as low as it has been and only one or two machines are sold in a year it is a quirk of arithmetic that one player may have a 100% market share in one year or that two may have 50% each. Customers are very well aware of the dangers of having only 2 suppliers. The fact is that if the market were large enough, MHPS and Ansaldo and others would be strongly encouraged to quote by the European buyers. We would probably then have a global market share split of GE/Alstom – 30%, Siemens – 30%, MHPS -20, other (Ansaldo, BHEL, Russians, new players ….) – 20%. When a market is small, market share is misleading and meaningless. In a strong market some of the manufacturers of small gas turbines would also try and follow their customers into larger sizes – a “Honda” strategy. 4. R & D is where I began my career and safeguarding innovation is rather special for me. There is a valid point regarding R&D and innovation and I think it would be perfectly justified for the EC to give approval conditional on some kind of assurance from GE that R &D centres (and possibly R & D jobs and budgets) in Europe would be maintained for some period of time. I don’t believe that innovation can be mandated, but I do see a potential benefit for GE – in time – in absorbing and – even adopting – some sequential combustion elements in their mid-range (rather than their largest) engines (see diagrams below). But that is a call for GE to take in about a decade from now. (It is probably just wishful thinking on my part). Alstom (as BBC) developed the sequential combustion cycle in 1948 and (as ABB) the GT24 and GT26 engines in the 1990s, when GE moved beyond the “F” class machines to their “FA” machines. 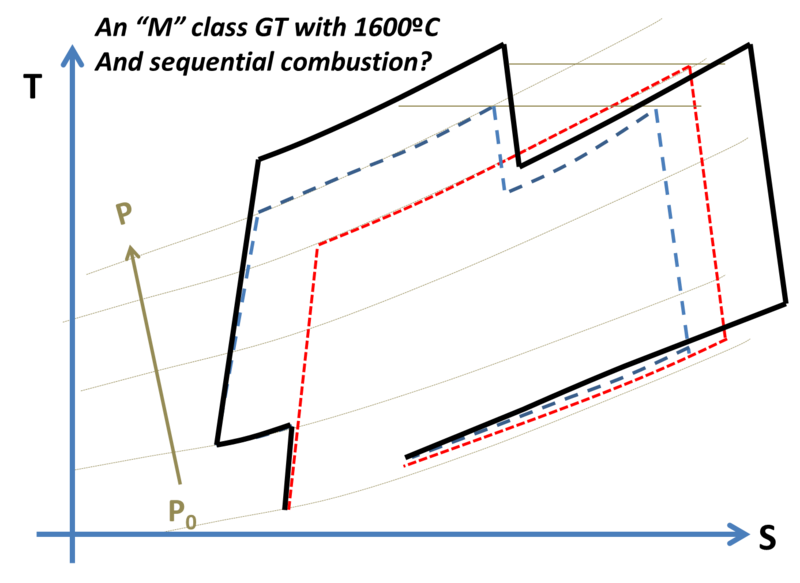 The choice was a forced one for ABB, and they had to follow the sequential combustion path because they did not have access to the high temperature blade cooling technology which was available to their competitors. All their attempts to acquire such technology from Russia failed. A technology agreement with Rolls Royce gave no technology ownership and had very strict limitations. 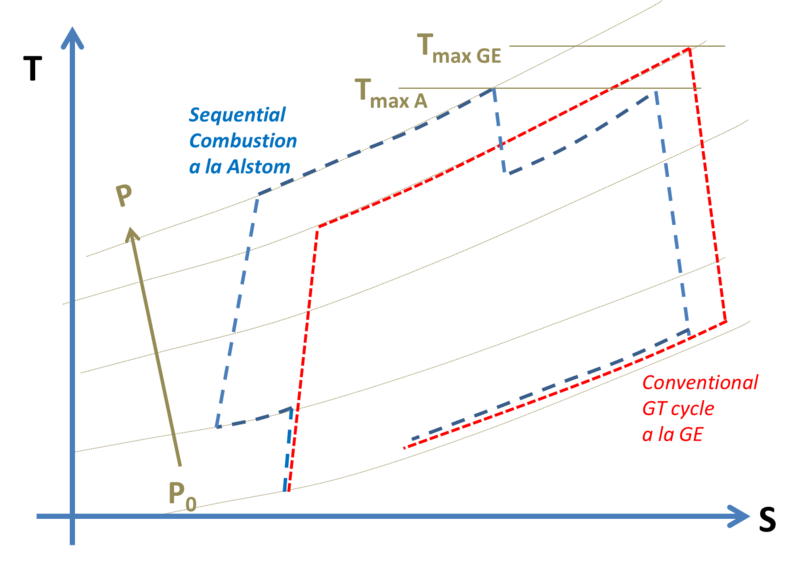 Sequential combustion eventually converted a weakness into a virtue and allowed ABB (later Alstom) to maintain efficiency and compete with “G” class machines even though they were effectively limited to an “F” class inlet temperature as a maximum. If ABB had not developed the GT24 and the GT26 – in spite of all their early challenges – Alstom would not have acquired ABB’s power generation business after their GE licence was terminated. (In fact the challenges were so large that ABB had to compensate Alstom through the acquisition price for the power business for all the problems that had to be fixed by Alstom in the field). Taking a very cynical view, ABB had reached the end of their road with GT development when they divested to Alstom. Alstom in their turn made devlopments that ABB could not but have also reached the end of their road for development of sequential combustion technology – again because of a lack of high temperature cooling technology – and wish now to divest to GE. Now as GE, Siemens and Mitsubishi have moved on to even higher inlet temperatures, the “G” class has gone on to become the “J” class. (The “H” class was Mitsubishi attempting to use steam cooling for the turbine blades which didn’t really catch on and “I” has been passed over for the designation of turbine class). Alstom, with its limitations on temperature have successfully squeezed the sequential combustion technology to approach a “G+” performance with temperatures slightly lower than a “G” class from the others. But Alstom now also has reached its temperature limits and, I suspect, it was the lack of a way forward for their machines to compete with “J” class machines which has been part of their decision to get out of power generation. But I like the concept of sequential combustion which is elegant and fundamentally sound and I look forward to the day when maybe it can be applied together with the high temperatures that GE knows how to handle. Then maybe we will someday see an “M” class gas turbine with 1600ºC and sequential combustion? It can be argued therefore that the acquisition is what may actually keep R & D alive instead of it coming to a stop in the cul-de-sac in which it is stuck with Alstom. And without R & D and high temperatures and new competitive “J” class products, Alstom’s days as a cutting-edge HDGT supplier would have been limited anyway. 5. The older GE machines are still serviced by GE licencees and former licencees around the world – including in this case by Alstom (for GE machines prior to 1999). This Alstom does by means of a special subsidiary set up for the purpose. This unit – Power Systems Manufacturing – specialises in formerly licenced GE machines and also acts as a “pirate” for Siemens and Mitsubishi machines. PSM’s product line includes … parts for GE Frame 6B, 7E/EA, 9E and 7FA machines, the Siemens/Westinghouse 501F (SGT6-5000F) engine and the Mitsubishi 501F engine. Siemens also has such a subsidiary unit – Turbo Care – to service – where they can – the machines of competitors. This used to be a separate Siemens entity but has now been approved by the EC as a JV with the Wood Group. The “pirate” service business is important to each manufacturer – for intelligence and competition purposes – but the volume is quite small. No customer would select a “pirate” rather than the OEM, except for older machines past their prime or perhaps to teach the OEM “a lesson”. The “pirate” business is just not possible on relatively new machines and really only applies to machines installed more than about 10 years previously – when all liabilities and potential liabilities of the OEM have fallen away. No GT owner would take the risk of resorting to a “pirate” for a relatively new machine. A customer would usually resort to “pirates” only when all investment costs have been fully written off and he is no longer looking for – or particularly needs – any performance or availability guarantees. Even design and manufacturing warranties to be provided are strictly limited since the “pirate” has to rely on reverse engineering. “Pirates” only come into the picture when the perceived risk levels are low. The EC concern that if PSM is merged into GE, that some competition for the older GE machines will disappear is not correct I think, because for these older machines the competition for service business is far more with other “pirates” than with the OEM. And there are plenty of “pirates” around. In the long run I judge that this acquisition is good for the customer, may even be good for R & D and even good for Siemens (and also for Mitsubishi). I imagine that any objections from Siemens are more for the sake of form (and because there is no love lost between Patrick Kron and Siemens). In any event, I expect that the deal will go through, but I will not be surprised to see an approval conditional on some assurances from GE regarding R & D centres, R & D jobs and/or R & D budgets in Europe. I think it highly unlikely – and a little meaningless – if the EC were to ask for divestment of Alstom’s HDGT business to a third party (if any such exists). The bottom line is, I think, that Alstom’s HDGT technology has come to a dead-end and can not be developed any further in their own hands. While the business can continue in a diminishing way for some years, Alstom technology has no long-term value except to another party which has access to high temperature cooling technology. To have Alstom continue with the HDGT business as an unwilling and reluctant player does no one any service at all. Was it biological or nuclear materials on X-37B? The technicians servicing the X-37B spaceplane shortly after the unpiloted craft glided to a computer-controlled landing Friday at Vandenberg Air Force Base are very well protected from something. With Ebola protective suits in mind, their clothing would suggest the presence of nuclear or biological materials being on the spaceplane which has just returned from its 674 day secret mission. They seem to be carrying their own completely isolated environment.